A view of Jerusalem's Old City as seen from the Mount of Olives, Dec. 6, 2017. It is rare and perhaps unique for the world to interfere with a country's choice of its own capital. But that is far from the only unusual thing about Jerusalem. 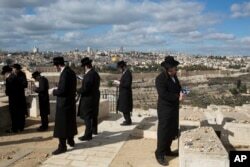 Jerusalem is home to key holy sites for the world's three monotheistic religions - concentrated in the Old City. The densely packed area, less than one square kilometer (one-third of a square mile), hosts the Western Wall and the adjacent hilltop compound revered by Jews as the Temple Mount, the spot where the biblical Temples once stood and the holiest site in Judaism. Palestinians revere the same hilltop compound as the Noble Sanctuary, Islam's third-holiest site, where the Al Aqsa Mosque and gold-topped Dome of the Rock are located. Nearby is the Church of the Holy Sepulcher, which Christians revere as the spot where Jesus was crucified, buried and resurrected. Adding to the mix, Jordan, the former ruler of the Old City, retains custodial rights over Muslim holy sites, while Morocco and Saudi Arabia also claim to be their protectors. This tiny area may be the world's most combustible piece of real estate. A woman walks past a poster praising U.S. President Donald Trump’s recognition of Jerusalem as Israel’s capital, in Jerusalem, Dec. 7, 2017. Jerusalem has long served as Israel's capital, hosting all major branches of government, even if not formally recognized by the international community. Yet nearly all of Jerusalem's 330,000 Palestinians - about 37 percent of the city's population - are not Israeli citizens, according to figures from the Jerusalem Institute for Policy Research. Israel captured east Jerusalem in the 1967 Mideast war and granted Palestinians “residency” rights that allow them to work and move about, without the right to vote in national elections. Palestinians living in Jerusalem aren't citizens of any country and travel abroad using temporary documents issued by Israel or Jordan. While eligible to apply for citizenship, few Palestinians have, fearing it would amount to recognition of Israel's control. Those who do apply complain of a lengthy bureaucratic process that can take years. Jerusalem's Old City is seen while Jewish Orthodox men pray in a cemetery in Jerusalem, Dec. 7, 2017, a day after U.S. President Donald Trump's recognition of Jerusalem as Israel's capital. Although Israel considers Jerusalem to be its undivided capital, most of the city's territory lies in east Jerusalem, land considered occupied by the rest of the world. The city nearly tripled in size after it captured east Jerusalem in the 1967 Mideast war, then annexed the area and expanded the municipal boundaries to include open space and neighboring Palestinian villages. About 60 percent of the city's residents now live in east Jerusalem. That includes over 200,000 Jewish Israelis living in areas that Israel calls neighborhoods and much of the world considers illegal settlements. Hard-line members of the Israeli government are currently pushing proposals to annex neighboring West Bank settlements and rid the city of outlying Palestinian neighborhoods that lie outside a separation barrier as part of a plan to strengthen the city's Jewish majority. Israeli police officers try to remove a Palestinian flag from Palestinian women protesting outside the Damascus Gate in Jerusalem's Old City, Dec. 7, 2017. Jerusalem is Israel's largest city. It is also the poorest, largely due to its high number of Arabs and ultra-Orthodox Jews. According to the Jerusalem Institute for Policy Research, 47 percent of its residents and 58 percent of its children lived under the poverty line in 2015. Ultra-Orthodox schools face criticism for not teaching important skills, such as math and English, while Palestinian areas suffer from neglect and a low number of women entering the work force. Most of the driving force behind Israel's economic engine is based in the central area of Tel Aviv, and many young Jewish Jerusalemites flock there for jobs in the booming financial and high-tech sectors. Jerusalem is home to the top-notch Hebrew University, but many of its students migrate to Tel Aviv after graduating. In addition, many families leave the city because of its high housing costs. In contrast to the vibrant coastal scene in Tel Aviv, many parts of the far more conservative Jerusalem largely come to a standstill on the Jewish Sabbath. Most shops and places of entertainment shut down and traffic slows to a trickle. In its many ultra-Orthodox neighborhoods roads are blocked off on the Sabbath and clashes have erupted when cars have traveled nearby or ventured in. Despite its deep poverty, real estate prices remain high and have been driven up by high demand of wealthy diaspora Jews who have purchased upscale vacation homes that remain empty most of the year - contributing to the “Ghost Town” feeling of several neighborhoods. After Trump’s Shift on Jerusalem, What’s Next for Palestinians?